This is my second knitted doily. I have used the thread size10 , and double pointed needle , and circular needle size 2mm. 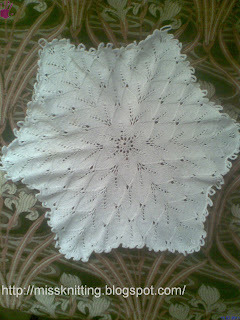 This doily also has a crocheted simple edge. I still love working with thread, and really think to make myself a blouse using a cotton thread size10. Thanks so much Birgit for your sweet compliment. your English is so lovely. thanks so much my dear Christa for your your sweet words. Hello Marlies, thanks so much for your sweet compliment. ein wunder-wunderschönes Deckchen und so filigran,sieht super klasse aus! Vielen Dank für deine lieben Kommentare auf meinem Blog,es hat mich sehr gefreut!